What is a Nebraska Promissory Note? Nebraska Promissory Note: What Is It? A Nebraska promissory note is a written agreement between a lender and a borrower. The purpose of the document is to identify the parties and set terms and conditions of the repayment agreement for the loan. A Nebraska promissory note may be secured or unsecured. An example of a secured promissory note is a car loan. If the borrower does not make payments as agreed, the lender will repossess the vehicle. The vehicle acts as collateral for the loan. Unsecured loans are signature loans. There is no collateral to guarantee that the loan will be repaid. The parties involved in a promissory note are the lender and the borrower. Sometimes, co-signers are also a party to a promissory note. Promissory notes are subject to contract law. In some instances, they may also be treated as securities. Under Nebraska state law, the maximum amount of yearly interest that may be charged for a promissory note is 16%. Lenders who violate usury law may find themselves in serious legal trouble. The date that the promissory note was created. This date, along with the date included with the signatures, helps prove that the agreement is valid. The date is also important if collections must take place in the future. The identity and role of each person or entity within the agreement. It is important to use the legal name of each person or entity entering into the agreement. Each person or entity should also have their role clearly mentioned. For example, PDQ Personal Loan Services, Ltd., Lender. If there is a co-signer, they should be listed as well. The mailing address for each party. List the mailing address for each party to the agreement. If the note is secured, include the physical address of the borrower and any co-signer if the mailing address is different. Sometimes a lender will have a mailing address for general contact and an address for payments. If the lender has a separate payment address, it should be included in the section where the repayment agreement is documented. The amount of the loan. This is the principal balance. It does not include the interest that the borrower will pay. Before a Nebraska promissory note is executed, review this number for accuracy. The interest rate charged for the loan. In Nebraska, the maximum amount of yearly interest that may be charged is 16%. It is expressed as per annum, annual percentage rate (APR), or annual interest rate. Repayment agreement. The repayment agreement explains how the principal balance and the interest will be repaid to the lender. This section should include the payment address, how many installment payments must be made, the amount for each payment, the due date for each payment, and if there is a late fee. The late fee amount should be documented within the agreement. It is also important to give information on when the late fee will be applied to the account. If the Nebraska promissory note is secured, include descriptive information about the collateral. Leaving out this information practically guarantees that a legal dispute will mean that the court treats the agreement as unsecured. Interest Due in the Event of Default. If the borrower defaults on the loan in some way, this clause states how much interest will be applied to the account. Payment Allocation. This is how the payments made are split between the principal loan amount and the interest charged for the loan. Prepayment. This clause explains whether the borrower will be subject to a financial penalty for paying off the loan before the end of the term. Acceleration. 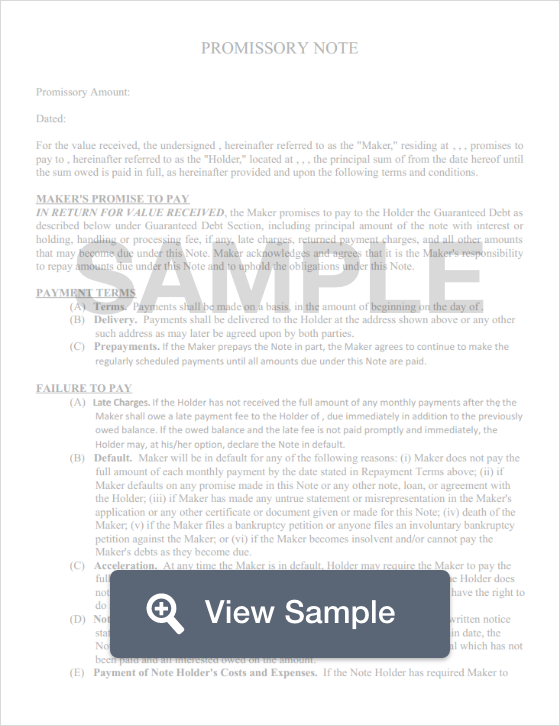 The lender has the legal right to demand payment in full if the borrower does not abide by the terms of the promissory note. Attorney Fees and Costs. If a legal dispute arises, this clause explains how the parties agree that attorney fees and costs will be handled. Waiver of Presentments. The lender is not required to be physically present in order for the borrower to make their payments according to the agreement. Severability. If one part of the Nebraska promissory note is not enforceable, the rest of the agreement remains in effect. Conflicting Terms. This clause explains how any conflicting terms will be handled and clarified. Notice. This clause states whether the lender will notify the borrower if the lender plans to file a lawsuit against the borrower. Governing Law. This clause lists the state whose laws will be used in the event of a legal dispute. In Nebraska, a promissory note does not need to be notarized. It must be signed and dated by both the borrower and any co-signer who is also party to the agreement.